Discussion in 'OS X Mavericks (10.9)' started by Eithanius, Jun 18, 2013. Am I to understand iTunes on Mavericks no longer support direct syncing of Contacts and Calendars from Mac to iDevices and vice versa...? Or am I missing something here...? Can't seem to find the iPhone Info tab on iTunes. That's not what OP meant. I don't know where it is now either. Ahh that makes more sense now. Bit slow this morning. It seems that the "Info" section has been removed when you go into the actual iDevice details. I don't have this setup anywhere in iTunes. I just set up a new iPhone 5 today and I can't sync my contacts because it's missing the Info tab. Yup the info tab does appear to have been removed. Hopefully that's just a bug. All of the Info tab Interface Builder files are present in the app's Resources. They are just never loaded on Mavericks. I rummaged about for a setting in a plist to enable the tab, but came up empty. "After much deliberation, engineering has removed this feature. Sync Services is no longer supported on OS X Mavericks." When this was first brought up, I had a feeling that Apple had gone this way. Its not going to suit everyone but with the push to iCloud, it was inevitable. Infact, if you are an iCloud user, and enable iOS 7 automatic updates and downloads as well as use iTunes match then the iTunes umbilical cord is obsolete. I guess the workarounds will have to be the 3rd party apps that allow iPhone browsing. Any recourse to get USB syncing of info back? I wonder if there's any way we can get USB syncing back? I will probably not upgrade to Mavericks unless I can have this. I have a lot of personal data which I'm not willing to share with Apple just to get it onto my phone. I'm willing to sign a letter to Apple requesting this or vote for it somewhere, but it's not clear where we should all go from here. I agree. It is insane go take USB synching away. I was thoroughly naffed-off when Notes syncing via iTunes was removed when the Notes app for Mac OS was released, but didn't think Apple would do this with Contacts & Calendar. As simple & featureless as it was, I came to rely heavily on Notes on the iPhone and being able to sync with my Mac. NOW I can't sync my contacts and calendar in Mavericks via usb on iTunes!!!!! What the FCUCK APPLE??????? 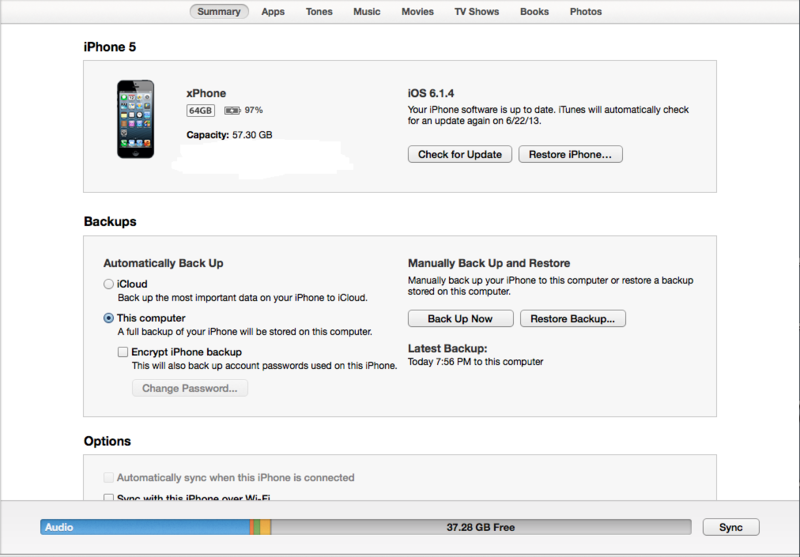 I don't have a slightest desire to use iCloud and was happy to back up everything locally, but not anymore!!!! Cmon apple whey did you do this???? Why are you pushing your clients to use iCloud????? I'm so disappointed......I hope there will be fix to this. I have the same problem and I already have upgraded to Mavericks. I've read that you can set up your own LDAP server and sync your calendar and iPhone with it. Thanks, I've heard that too but have never done such a thing and don't really know if its easy or not. Any info would be highly appreciated. Pretty easy with OS X Server AFAIK. It is easy with the Server add-on. I have been running my own server since before SL doing this to control my environment. How does syncing work then on your iPhone? I use my hosted caldav calendar for calendar syncing, my cardav contacts for contact syncing and the mail server (an IMAP server hosted on the server itself) for hosting and syncing my emails these are all set up options available on the iPhone. The rest of the apps, music, books, and pics are sync'd as they always were for me through iTunes on the server itself, either using wifi sync or plugging in directly through USB. I use the same settings to sync all my mail, contacts, and calendar information to my other devices (macs, iPods, etc). I use my hosted caldav calendar for calendar syncing, my cardav contacts for contact syncing. I have multiple Macs for multiple rolls, each Mac is associated with one or more iDevices. They do not share calendars. Is there a way by setting up a local caldev server to associate different Macs with their own iDevices. How hard is this to set up and manage? Also any third party apps that push calendars/contacts from Macs to new iDevices? Is there a hack to add SyncServices to Mavericks? Any update about possibility to back up contacts and calendars locally using USB sync in Mavericks without iCloud or setting up own servers?